A few kilometres west of Wamba, the Land Rover stopped. 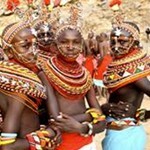 Our Samburu guide had spotted three young boys no older than thirteen years emerging from the bush. Big smiles on their faces, they greeted Mathew who, appropriately was born in the shadow of the majestic Mathews Range of mountains in Northern Kenya. Armed with bows and arrows it was soon clear that these boys had recently undergone their circumcision ritual and had left the village to perform their first duties as morans (Samburu for warriors). Each boy, as part of their initiation, had a necklace of dead birds around their necks. They are not permitted to wash for a month…perhaps today was quite early on in their initiation period. We continued on, reaching a good bridge to cross over the Ewaso Nyiro river. But for the badly needed heavy rains in the past weeks, we could have shortened our journey by a couple of hours and crossed much lower down on what is often a dry or shallow river-bed. Today, the savannah plains between the Mathews range and the Laikipia plateau were pretty green but signs of severe soil erosion remained. Something I had seen from the air in all too horrific breadth a few years earlier. 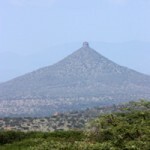 We were journeying today from Sasaab lodge in the Samburu area to Ol Lentille in Laikipia. From Sasaab itself we could see the exact mountain we were heading for due west. To get there though, involved some serious criss-crossing north, west, south of this usually arid landscape. Sweet sixteen was the easiest and most amusing landmark during our journey. Further on we stopped again, seemingly in the middle of nowhere (these were unmade roads) as an elder came marching down the track. Fresh greetings were exchanged as Mathew explained he knew this man of old. Eventually, we reached the small town of Ol donyo iro. Onesmas, our Samburu moran, also on board, told us that he had walked here from his village a few years ago to buy some cattle. It had taken him three days. Later on, four girls in Samburu regalia were standing by the side of the track as we negotiated a particularly slow, rocky bit. Onesmas, a lithe 24 year old must have given them some sort of encouragement as they were soon giving chase. A relatively smooth bit of track ensured he escaped their attentions as the Land Rover gained second gear. After five hours we had not seen another car, well not that one was moving anyway. Sometimes in Africa it is worth considering a road journey if you can put up with the bumps and potential stranding. I, for one, always find these journeys some of the most memorable aspects of a safari. You get to see real unadulterated Africa and I feel blessed I have often experienced what you will never get in some scripted glossy brochure game reserve. Enough ramblings. The commercial side of me must mention a few places that have been particularly special in my journeys during 2009. All on the theme of “more than just game”. In the last fifteen years or so safaris have become much more than ticking off the Big Five and with a plethora of activities on offer as well as the chill out aspect of a supremely comfortable lodge many places now warrant a stay of far longer than the traditional two or three nights before moving on. All are very family-friendly. 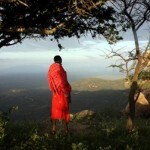 Ol Donyo Wuas: nestling in the Chyulu Hills, south of Nairobi is an evocative place. Set in 250,000 acres of Maasi land you can gaze from your room across the plains to the mighty Kilimanajro on the other side of the border in Tanzania. The lodge has recently been completely re-built in luxurious style: most rooms have plunge pools, there are lavish bathrooms and comfy flopping areas. Game drives yes but you can ride out onto the plains for a sundowner, climb up to the montagne forest behind, see if you can out-wit the anti-poaching blood hounds, have a massage, visit a manyatta, go on a bush survival course. I took some nephews here in March, they thought it was seriously cool. Ol Lentille: imagine your own private house with personal butler and dedicated guide located in some of the most dramatic landscapes of East Africa. Choose from the Eyrie, the Sultan’s house, Chief’s house or the Colonel’s house. All individually styled I can assure you it is difficult to pick a favourite. Each house sleeps between two and six people. Not a place to see huge amounts of game although I was lucky and saw three leopard together on my last night. Ride, have a lot of kiddie fun on quad bikes, get fit on a mountain bike, trek with camels, play croquet, boules or “bao”. Visit the spa for inclusive treatments. Want more? Call up a helicopter at some considerable expense and go trout fishing on Mt Kenya or to Ol Pejeta for some chimp and big animal spotting. Climb up the mountain and get blown away by the panorama beneath you and almost blown away by the wind. Sassab, Samburu: away from the relative busyness of the main lodges in the Samburu reserve is this amazingly designed lodge full of clever design features. With breathtaking views over the Ewaso Nyiro river and beyond to the Laikipia plateau you can contemplate the wilderness and maybe see elephants coming down to drink beneath you. Each of the nine rooms has a plunge pool, a relaxing area and huge open plan bathroom which you are likely to share occasionally with a rock-hyrax or a bush-baby. The beds are vast and if you don’t wish to be disturbed you stick a Samburu spear in a hole near the entrance of your room to dissuade visitors just as they do in the village which you can visit close-by. Go on a camel trek to one of the most dramatic sundowner spots I know, visit the Spa (particularly welcoming design) and check out the Samburu Special Five: Grevy’s Zebra, Reticulated Giraffe, Somali Ostrich, Gerenuk and Beisa Oryx. 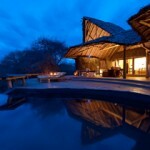 These lodges cost from about £375 per person per night on an inclusive basis. (excludes conservation fees and getting there) Please call for a quote and to hear more.